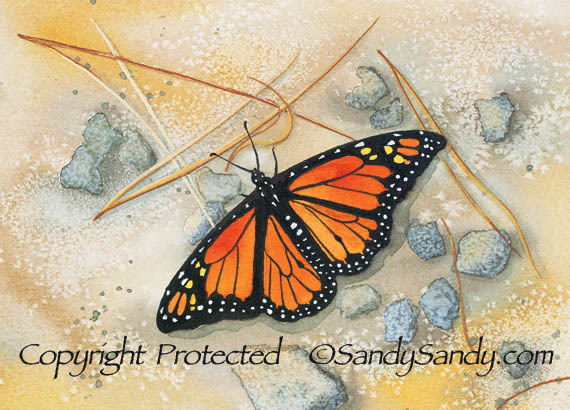 Monarch Butterflies are the only type to migrate both north and south as birds do. It lays its eggs on the Milkweed plant. Later, when the paupa matures to the larva, or caterpillar, it feeds on the Milkweed leaves, ingesting substances that make them distasteful to birds and other predators. Every fall flocks of these brilliant specimens can be seen all across North America as they travel to their winter roosting sites in Mexico, California and the Caribbean. Some international efforts are being made to protect the butterflies, as much of their winter grounds are now under devastating land development which could mean this beauty may soon be on the endangered list.